In 2005 or thereabouts my wife got her motorcycle endorsement and conceived a notion that she wanted to ride a Vespa around Key West as part of her job visiting recalcitrant students. We found an almost brand new ET4 150cc automatic with 236 miles and a couple of slight bumps on the leg shield where the first owner apparently dropped the scooter not even causing the paint to chip but enough that she lost her nerve. $3500 got us a scooter complete with accessories and little did we know many years of faultless service ahead. In 2007 I bought a Vespa 250, a lovely machine that was part of a batch with faulty electrics and cheap fuel pumps from China and that I had to sell to save my sanity. In ten months it spent more time in the shop under warranty that it did on the road and I still put ten thousand miles on it I liked it so much. I replaced it with my Triumph Bonneville motorcycle still running faultlessly after a decade and 98,000 miles. 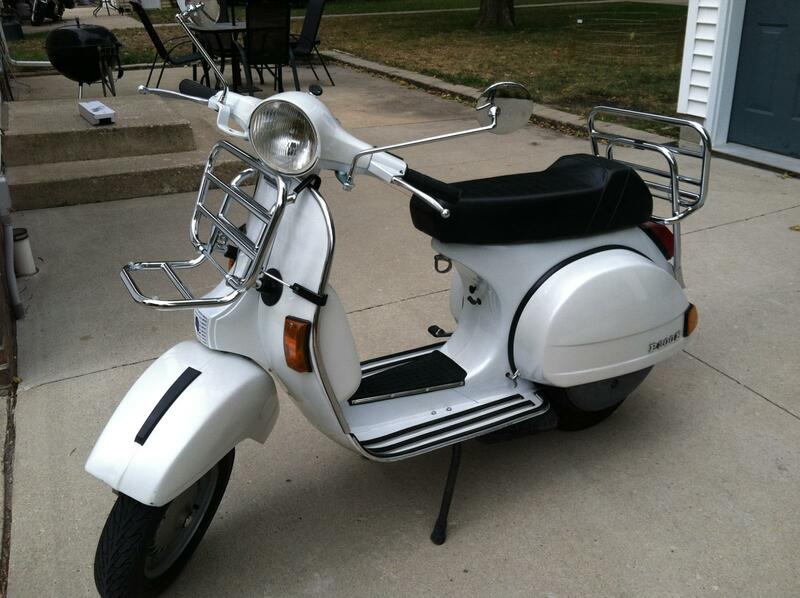 My Vespa itch which I have had all my life since my first 50cc in 1970 had to be satisfied and I bought a 200cc two stroke. The idea was it would commute at 60mph and being almost maintenance free and carry a spare tire with split rims such that I could replace tires at home easily. Simple solid and reliable. It took me five years to come to terms with the fact that it was slower and less reliable than I could stand and miraculously I got rid of it in a trade with a bright orange Vespa S150, a 2008 scooter with 326 miles on the clock and like brand new . I didn't really need it as I have been using my wife's ET4 consistently over the past 13 years but I love the color and the style of the S150 and it has the same motor, a simple air cooled two valve motor with the addition of a fuel pump for some reason. I figured it would be as rock solid as the ET4 and five thousand miles later it has proven to be just that. I find myself always picking one of the Vespas over the 865cc Bonneville for my commutes these days. Thy are light comfortable and easy to ride. They don't have a clutch which relieves my arthritic left wrist and they will hold a true 60mph on Highway One on the flat in neutral wind conditions, easily enough to keep up with traffic. And not so powerful to tempt me to speed or pass even at speed, or risk getting a ticket. For some reason it has taken me a while to come to terms with the ET4's funky aesthetics and the lack of a gearbox but when I think back over the years it has been exactly what I wanted ina Vespa, reliable, fast enough and easy to ride and I have overlooked it because I am an idiot. On top of all that though the paint shows signs of aging around the edges it looks amazingly fresh and new even exposed all it's life to the corrosive Keys atmosphere. Indeed nowadays with disc brakes front and back, water cooled four valve engines with braking systems the old ET4 has itself become a classic, the first of the four stroke automatics first designed twenty years ago. I have earned to chish my alabaster classic and am happy I still own it. And I do acknowledge that I am changing at least for now. I don't anticipate a future of not riding and in retirement I foresee a lot more touring and traveling and day trips and so forth. Rusty will be older and I will live in a place where a day trip by motorcycle will be satisfying and get me home in time for a romp with my older buddy. But for now my sweet spot is a Vespa 150, air cooled and old fashioned but modern at 60 mpg and 70 mpg, thus surprising the commuters in big slow trucks and distracted drivers of sedans suddenly passed by a hairy old hobbit on a moped on the Overseas Highway. I feel no rush to make myself youthful with 800 pounds of loud heavy awkward motorcycle. and my Italian adventures remind me I don't need 170 horse power every day.